If you like the standard blocks but you want to change the mobs then install the Mob Squad. This texture-pack will turn the most frequently encountered mobs into something bright and unforgettable. There are 10 creatures that will have a completely new look. The creator of the pack worked only on the mobs, so do not wait for something new. Believe me, you have not seen such creatures yet and there hardly exist such textures. Mob Squad excellently raises the mood and can be used to create beautiful screenshots or videos. 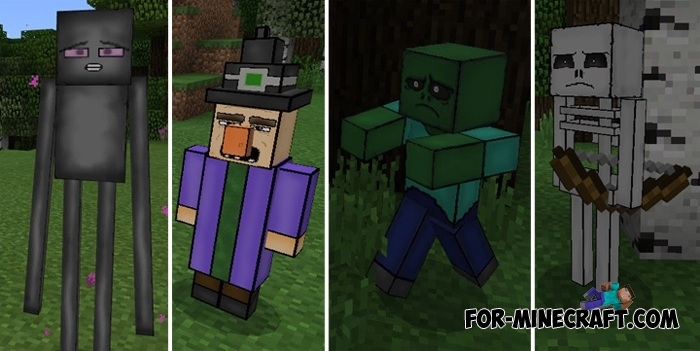 One of the most popular is Mob Squad videos which is a prototype of this texture-pack.